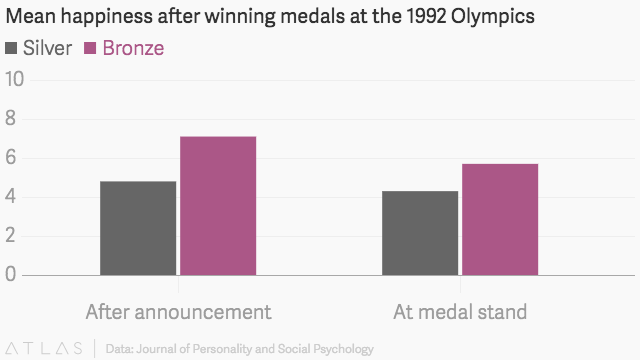 According to researchers, Olympics athletes are happier after winning bronze medals than they are after winning silver, and it actually makes a lot of sense. In 1995, psychologists Victoria Medvec, Thomas Gilovich of Cornell University and Scott Madey of the University of Toledo, asked their undergraduate students to watch videos of the 1992 Olympics in Barcelona and rate the facial expressions of the athletes on a 10-point scale. The scale ranged from "agony" to "ecstasy." Ultimately, the study found athletes who won bronze exhibited higher levels of overall happiness and satisfaction than those who won silver both when the final results were first announced and when they were on the podiums. Other studies have reached similar conclusions, and all of this seems to be linked to the fact silver medalists are more focused on what they missed out on -- the gold -- while bronze medalists are just pumped they actually performed well enough to receive medals. There have been a number of great moments throughout the Olympics in Rio, but one of the best arguably occurred when US swimmer Cody Miller won bronze in the men's 100m breaststroke. He celebrated like he'd just won a gold medal in every Olympic event. It was clear he was just happy to be there in general, and winning a medal -- any medal -- was the icing on the cake. Similarly, a video of Chinese swimmer Fu Yuanhui learning she won bronze when she thought she'd placed fourth went viral due to her overjoyed response. Based on the research mentioned above, it seems Miller and Fu Yuanhui's ecstatic reactions to winning bronze might not be coincidences. This is yet another way the Olympics teaches us about the strange and mysterious nature of human psychology and emotions. With that said, it's inspiring to see people so happy and satisfied winning bronze in a world where we're taught to believe the only thing that matters is placing first. Sometimes, we all need a reminder simply stepping into the arena and putting yourself out there are amazing feats in and of themselves. This isn't just a lesson for Olympic athletes, it's a valuable perspective for all of us.